We’d always recommend bringing you own bike – hiring a bike slightly reduces the logistics of taking your own, but comes with some significant drawbacks! Firstly, you are going to be riding unfamiliar trails on an unfamiliar bike – basically, you simply won’t feel at ease and you’ll probably not enjoy the riding quite as much. Secondly, it’s going to cost you lots more – even the most expensive airline fees are much cheaper than hiring a bike. Thirdly, you are never quite going to get the bike feeling “dialled in” over the course of a week – suspension settings and other tweaks are tricky enough on your own bike, let alone an unfamiliar one. In contrast, you will have a much more enjoyable and less unpredictable time riding the bike you know and love. Bike bags are cheap and effective and it only takes twenty minutes or so to get it packed away, our full mobile workshop facilities are available to you at all times to assemble and disassemble your bike at your destination – there’s no messing around in chalet gardens and losing allen keys in the grass on our holidays! In over 20 years of flying bikes around Europe on dozens of trips, and meeting literally thousands of people from flights we’ve only had two incidents where a bike didn’t arrive entirely unscathed. One was a broken mech hanger bolt, the other a bent disc – and on both occasions the person concerned admitted they hadn’t packed it properly! If packed correctly it’s very safe and easy – and usually your bike goes through “outsize baggage” – which tends to mean that it is taken to and from the flight by hand rather than rammed amongst thousands of suitcases on conveyor belts! We have also tended to find that your bike appears long before you suitcases – so there’s no extra time taken up waiting around either. We would always recommend bringing your bike with you – it is better than hiring a bike in every way imaginable! We do have a bike hire partner who offers fantastic equipment if you are really determined not to bring your own – please see further down the page for additional information. Overall we’d ideally recommend a longer travel, Enduro / All-Mountain full suspension bike – probably 130mm or more –and bikes with 150-170mm of travel will definitely feel in their element. Riding in the big mountains of mainland Europe throws up a very different set of riding challenges to those which many of us are used to at home. Yes, there are more technical trail features – but the most important difference is simply the length of the climbs and descents! We will often be descending for hours at a time – and the physical impact that can have on the rider is not to be underestimated! You will can have plenty of fun on a front suspension bike, but if you are wanting to bring a hardtail we’d definitely recommend a less racy model, with more aggresive “all-mountain” geometry (short stem, wide bars and a slack head angle) with at least 140mm of fork suspension travel to get the best from your holiday. 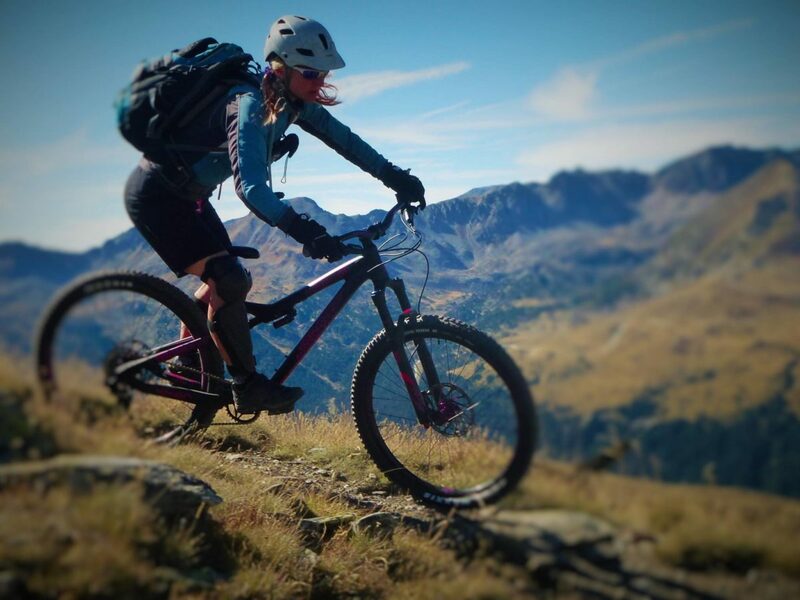 Bike Park Holidays – Do I Need a Downhill Bike? 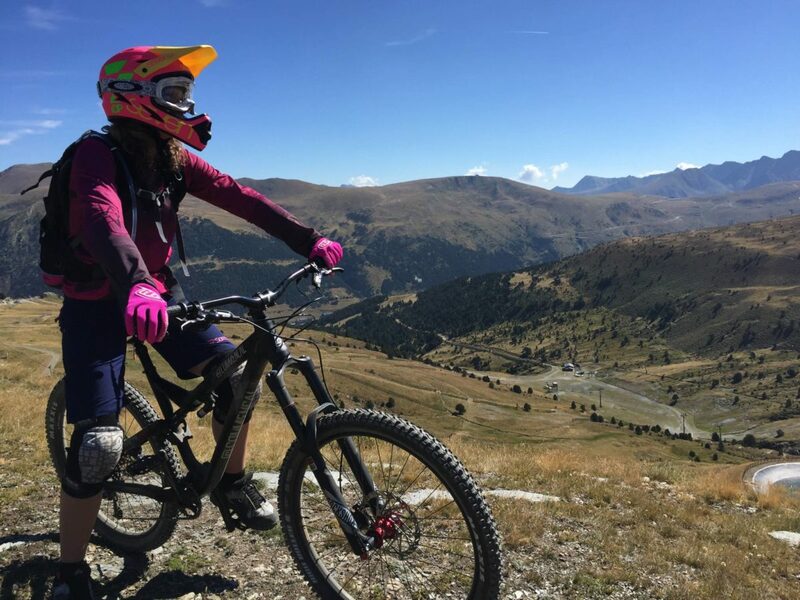 The Downhill trails in Andorra are fantastic – and every rider who visits with us absolutely love teh Bike Parks, whether they are on trail bikes or gravity bikes. Vallnord’s trails higher up the mountains are very fast and flowing in places – but once you descend into the treeline the mountain sides drop away into the valleys very quickly. We’ve ridden these trails on normal trail bikes – and modern generation 160mm bikes will cope more than admirably on most trails. However, the Black graded trails such as the World Cup/ World Championships track are very demanding indeed (both for bikes and riders! ), and we found that even the very longest travel trail bikes felt very sketchy on one or two sections in particular! If you want to ride everything in the park you’ll want a dedicated DH or Freeride bike here, with at least 180mm of travel and nice slack angles for the steeper sections. If you plan on exclusively riding in the bike parks we’d recommend something with slacker frame geometry and more travel – short travel bikes and hardtails will very quickly feel out of their depth amongst the tough elements of the Bike Park tracks. 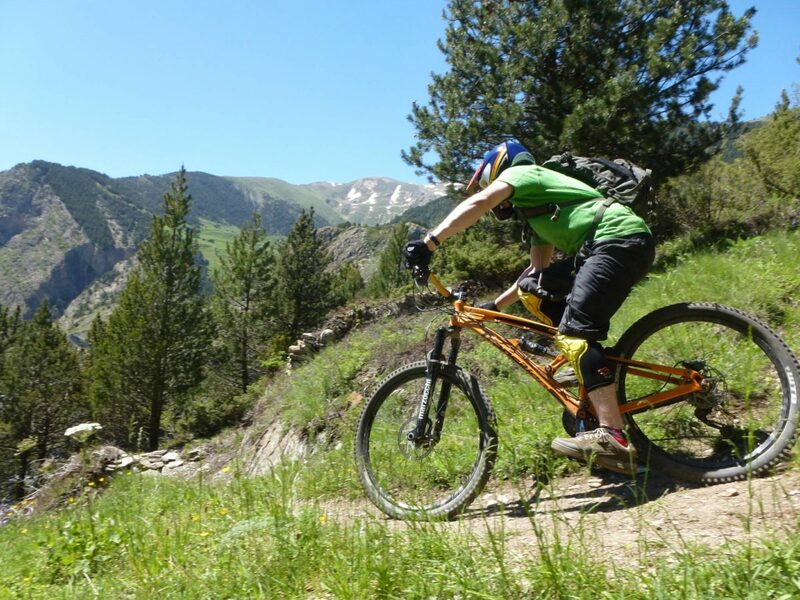 Simply the nature of constantly descending on Andorra’s dry, rocky terrain can be very physical – so as a minimum we’d recommend an Enduro bike, probably with at least 160mm of travel – and in order to ride the toughest trails with a big grin ideally we’d suggest a dedicated DH or Freeride bike with 180mm or more travel. 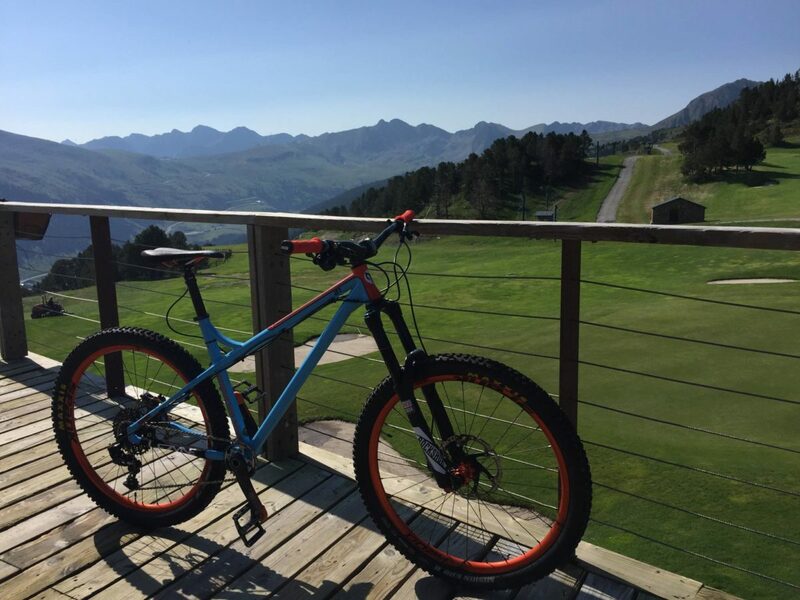 You will have more fun in Bike Parks on a “bigger” bike – and the usually more bombproof components on dedicated gravity bikes are far more able to cope with the rigours of park life! We don’t have a fleet of hire bikes, as most people genuinely prefer to bring their own. Owning fleets of hire bikes is also complex and expensive – companies that offer cheap or free hire bikes are normally either hiding their cost in another charge, or, more often, are providing cheap or substandard equipment. We’ve heard lots of complaints from people who have collected their hire bike to discover that it’s either a very basic model, or a complete wreck! At Singletrack Safari, we don’t want to add to these tales of bike-related misery, so we have recommended hire partners if you really, really don’t want to bring your own, or you don’t own quite the right type of bike for the trip…the hire shops we recommend offer a great range of bikes, and we know that they maintain their equipment to a very high standard. 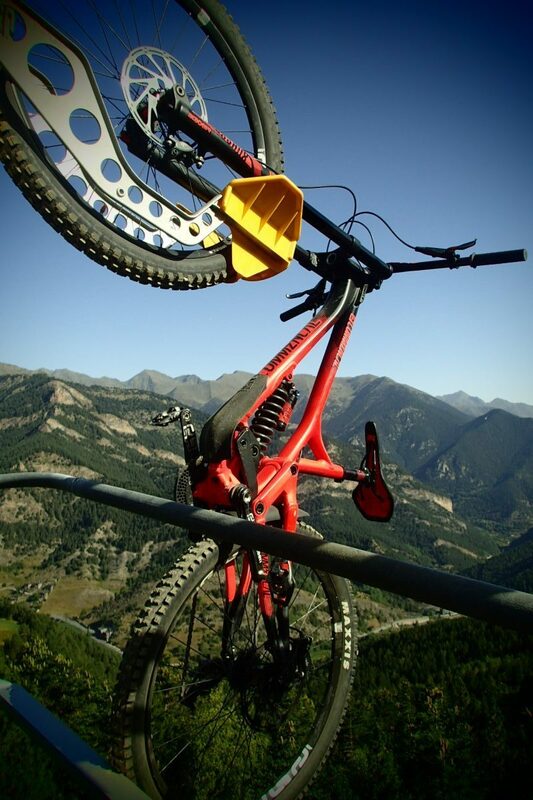 They are not a cheap option, however in Andorra they cost significantly less than in the Alps!